Many who attended the first annual LogiCal-LA conference reported that they had a very nice time. We received some terrific commentary and very positive statements on the returned survey sheets. Unfortunately to break even, we needed more attendees. We now find ourselves in paying back our generous donor who loaned us the startup funds. February 9-11, 2018 will be the date for the next annual LogiCal-LA conference. We are very proud to include astrophysicist Lawrence Krauss as our keynote speaker and are working hard inviting many other speakers who will enlighten and inspire you. Los Angeles, California desperately needs a scientific based skeptics conference and LogiCal-LA is proud to fill in that void. Promoting critical thinking skills and the use of science-based evidence needs to be advanced. Educating the public on how to develop and use critical thinking skills must be done by us – the Skeptics who care! If you feel this is a worthy cause and you want to support the growth of science-based skepticism, please make a $20, $50, $100 or more donation now. Please note that all lectures from the 2017 LogiCal-LA conference are now on YouTube for your viewing pleasure. We just had a $500 donation to help pay for transportation costs for one of our speaker for next years LogiCal-LA. Thank you! (You know who you area). This person received a complimentary seat at the conference and admission the VIP cocktail hour. Please make a donation to the next LogiCal-LA to support the promotion of scientific skepticism. 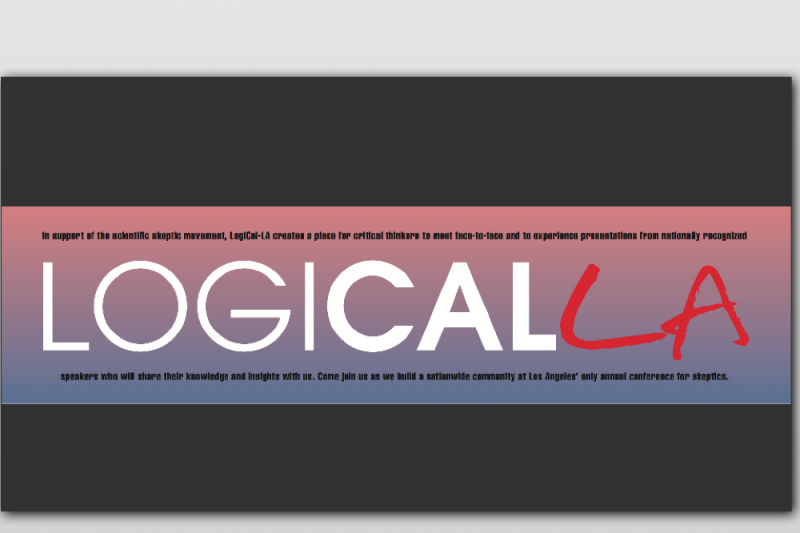 We have added a few more weeks to the LogiCal-LA fundraiser. If you haven't make your contribution, please consider doing so now. Any amount will be appreciated, however, those who donate $250 or more will receive a two-day ticket for the 2018 conference. If you cannot attend, the ticket will allow 4 students to attend. We are proud to have astrophysicist Lawrence Krauss as our keynote speaker at the 2018 LogiCal-LA conference on February 9-11, 2018. The LogiCal-LA GoFundMe online fund raising campaign is going well. It will continue until Match 15, 2017. If you have not contributed to this worthwhile cause, please do so before the deadline date of March 15, 2017. Any donation is welcomed, and frankly, if each person receiving this message donated $20, we could quickly reach our goal. We plan to invite Bill Nye to be a speaker in 2018. As scientific skeptics, we study the evidence of any claim. So, while we have not set the actual date of the 2018 conference or solidly booked the two above mentioned Skeptic Super Stars, we can guarantee that your donation will be put to good use in furthering the cause and planning the next LogiCal-LA conference. Everyone loves a good deal so we are offering, to the first 20 people who donate more than $250, one free “All Conference Pass” admission to LogiCal-LA 2018 which will include VIP seating, admission to all conference events such as a pre-conference party shows and/or concerts. In addition to our offer, any donation over $350 will include an invitation to a VIP Cocktail Hour, where you will be able to enjoy quality time with many of our speakers.